Alex Cave, a retired CIA operative, is drawn into a situation where the fate of civilization will be determined by his actions, in this three part saga. The tanker left Valdez Alaska with a full load of heavy crude oil for a routine trip down to Washington State, until the crew brings the ship into the Puget Sound. One crew person manages to scream for help on the emergency frequency, but it is too late. When the U.S. Coast Guard arrives to investigate, a lone man is standing at the railing, but he is not part of the crew. His name is Alex Cave, a vacationing geology instructor who had seen a brilliant flash of light around the tanker and also responded to the distress call. When Alex explains to the Coast Guard Captain that the ship is deserted and the crude oil has mysteriously vanished without a trace, the Captain thinks he’s mad, until he learns Alex is also ex-CIA and advisor to the Director of National Security. The next day the Coast Guard frantically searches for the massive spill, but cannot find a trace of the oil, and the corpses of the crew are discovered frozen on a mountain, one-hundred miles away. Soon panic grips the Pacific Northwest when the oil in the Alaska pipeline and west coast refineries mysteriously disappears. Transportation of basic necessities cannot reach the cities and common citizens turn to primal instincts to survive. The only clue Alex has to work with is a dollar size crystal found in the hold of the empty oil tanker. Can Alex solve the mystery before it’s too late? Or will the world succumb to . . . DEAD ENERGY. When the Polar Ice Sheet mysteriously expands by thousands of square miles, the sudden freezing temperature begins to alter the weather patterns on a global scale. The weather experts call it: The Polar Vortex. Alex Cave joins the scientists on the high-tech research ship Mystic, and they head north to investigate, where they discover a massive wall of crystal clear ice. 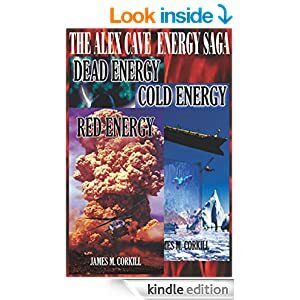 As the ice continues to expand into the Bering Sea, Alex and the scientists realize if it continues the world will enter a new ice age. Will Alex figure out a way to stop the expansions? Or will humanity be extinguished by . . . COLD ENERGY. From a distance the island appeared as a black nodule in an otherwise empty ocean. From the air, a hollow center was visible. But inside the crater, an unimaginable treasure was embedded in the rock: An alien spaceship. When Alex discovers a piece of incredibly powerful advanced technology inside the spaceship, he realizes if it falls into the wrong hands it could end all life on the planet. Everything goes well until he is betrayed by one of his colleagues, who steals the device and kidnaps the one person who can figure out how to harness its power. His friend, Doctor Henry Heinz. And if this wasn’t enough, Alex’s past actions while working for the CIA have come back to haunt him, and his loved ones are put in grave danger. On this emotional rollercoaster, Alex literally feels the weight of the world on his shoulders as he is torn between saving the ones he loves, and saving humanity from extinction. Is there a way he can save both? Or will all life on the planet be destroyed by . . . RED ENERGY!